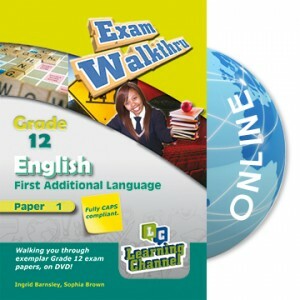 On this DVD, a highly qualified Grade 12 English First Additional Language teacher will "walk you thru" Paper 3 of English First Additional Language. 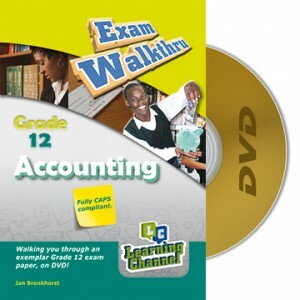 This DVD shows the teacher taking you through the exemplar papers and clearly demonstrating, step-by-step, how to approach, interpret and unpack questions in the papers and how to achieve the best possible answers to those questions. 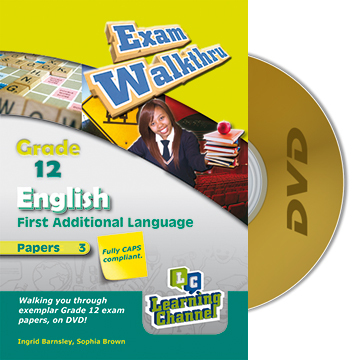 This DVD does not only provide valuable practice and preparation for the examination, but also serves as a valuable revision tool for the content covered by the English First Additional Language curriculum. As they say: "Practice makes perfect!"